Benedikt & Jäger’s full line of IEC style thermal overload relays provide motor overcurrent protection for a variety of applications. B&J offers overload relays that pair with both our standard “K3” contactors and our “K1” mini-contactors. 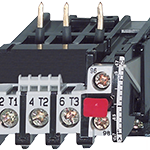 Contact us for additional information on your contactor and overload relay needs. Copyright © 2019 Wallin & Co AB – Powered by Customify.